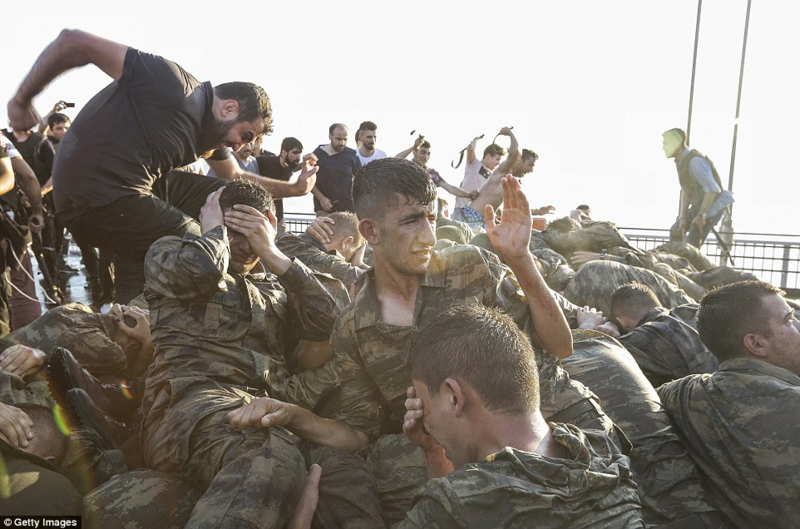 Failed Turkish Coup: Sabotage, Incompetence or Deception? To understand the coup in Turkey, we have to analyze the reasons that led the plot to fail. A premise: was there really an intention to overthrow and shut down Erdogan’s government? And who are those behind the coup? Starting from these questions and exploring the possible answers, we get a reasonable and authentic framework for a story still very confusing. The arrest of the head of State. The nomination of a representative for the coup, presented through a press conference on national media to reassure the population. Controlling all the information/communication sources. The support of at least a substantial part of the police. Taking under civil and military airports. Full control of the skies. Failure to arrest Erdogan is a very important indication of the real intentions to overthrow the government. The president was on vacation in a resort on the Mediterranean, as soon as he learned about the coup, he immediately took off in his private jet and urgently released the famous message via FaceTime, echoed by CNN Turk where he called on people to take to the streets in order to defend democracy. While he continued to fly unobstructed in the Turkish skies, many mosques in Ankara and Istanbul began to convey similar messages calling on the population to take to the streets. A few minutes later around 1:00 AM, most of the Turkish people were receiving an SMS message that again urged the population to take to the streets and protest the ‘revolution’. Just when the situation seemed to be solved, around 3AM Erdogan landed in Istanbul. Notably, more than four F-16s were flying over Ankara in the hands of rebel forces. 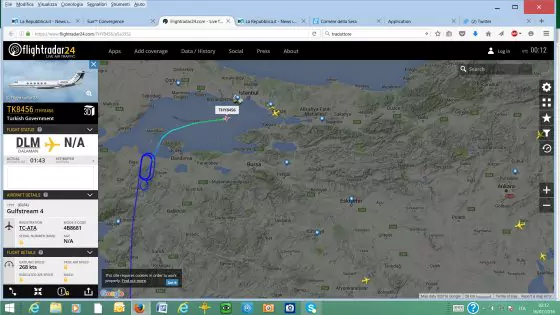 It still remains incomprehensible, for the success of the coup, why the pilots did not try to at least intercept Erdogan’s flight (the transponder was on all the time, the plane was visible on Flightradar). It was precisely the vision of Erdogan on TV and the reassurance that he was still alive that triggered his supporters to pour into the streets. Moreover, the bombing of the presidential palace in Bodrum by rebel forces, while Erdogan was in an entirely different location, still makes no sense. The failure to appoint a credible representative may be attributable to poor planning and experience, or something deeper, perhaps linked to a sabotage of the coup. Forces and political representatives probably withdrew at the last moment. We can continue speculating on this aspect, but for the meantime this decision remains simply a big mistake made by the military junta. The third, fifth and sixth points are most likely related to a strong unwillingness of men and inexperience (only 3 generals and 29 colonels). The bulk of the troops, made up of simple soldiers and tanks were deployed around the parliament (the seventh point) and in the vicinity of two bridges very strategic in the city of Ankara. A lot of speculation still remains on the reasons regarding the enormous lack of availability in terms of resources. Probably this can be explained by withdrawal of some participants at the last moment. The same can be said about the statements of some soldiers arrested after the government overthrow who claimed in many cases to not know why they were there and claiming they had only obeyed the orders from above (it’s also a great excuse to put out during a failed coup). Another common excuse mentions soldiers believing to be part of an exercise. Another decisive element is the one listed at fourth and ninth points. Erdogan, during the course of his years as a president, transformed the police into his personal guard thanks to impunity, wage increases and an American style of law enforcement militarization with the excuse of fighting terrorism (strictly Kurdish). The move paid off: it was the police who arrested and disarmed most of the military. Soldiers, defeated, simply laid down their arms without engaging in a shootout. The outcome is attributable to a lack of men and perhaps also to a lack of will in transforming a defeat into a civil war, with deaths on both sides. The more or less peaceful outcome of the failed coup is a strong argument against the hypothesis that Gülen and the CIA were behind it. The eighth point is particularly interesting. Initially the NFZ was achieved by rebel forces but in the course of the evening a No-Fly-Zone was declared above Ankara by the loyalist forces, ending the government overthrow. The most spectacular aspect of the coup is 4 F-16 jets shown in numerous videos hitting the parliament, Erdogan’s presidential residence and shooting down of two police helicopters. Instead of using air power to neutralize the deposed president, they preferred to show a senseless use of force that did not help their cause at all. In all probability, someone pulled back at the last moment, sending out a small group, badly organized, unprepared and without adequate command structure or plan of action. It may have been a skillfully maneuvered tactic by Erdogan, starting the coup and then letting it fail, or even a disagreement inside the military. It is unlikely, however, that an external planner, such as NATO / CIA, after organizing the coup in a hurry would draw back. They would fight until the last Turk standing. However, the sensation remains that someone failed to appear at the crucial moment. The plot was probably authentic in its intent and the words used by military in their press releases seem to confirm this impression. They attributed the coup to the lack of freedom in the country and a foreign policy conduct that has disintegrated the pillars on which Turkey relies. It’s a sensation and a feeling that has historically been very important within the Turkish military. This is not something that Erdogan discovered recently. It remains to be seen whether these impressions are correct. A good chance could present itself during the military trial of the coup leaders. Bottom line is, there is no evidence that shows an external involvement of the United States as many speculate. Erdogan mentioned Gülen (his bitter rival) as the leader of the revolt demonstrating nothing, since everyone knows that the 75-year-old is linked to the CIA. His accusations do not automatically imply that he is right or is telling the truth. A. A coup organized by the CIA resembles what we have sadly seen in Ukraine: death and the incessant chaos until the collapse of the nation. Nothing comparable to what we saw in Istanbul or Ankara. The military in this case laid down their arms, they didn’t kill the population with snipers as seen in the Maidan square, wreaking havoc. B. Erdogan’s plane was in the air for hours, undisturbed. If this had been organized by Gülen/CIA, with 4 F-16 available, it is incomprehensible why not to shoot down the plane or take Erdogan into custody. C. A coup cannot be organized in two weeks. And it’s far-fetched to assume that Washington created this situation within a few days, to stop a rapprochement between Erdogan, Putin and Assad. D. Erdogan has every incentive to get the best outcome from this situation. He immediately closed the American air base in Incirlik and asked Washington that Gülen be returned. He said that any country that hosts Gülen, directly mentioning Obama and the United States, is an enemy of Turkey. E. As soon as he took back his office, he began to arrest thousands of judges and military, starting an internal purge that had to be in the preparations for months. This would explain the possible meddling of Erdogan in the coup. He could have allowed, ignored, or even encouraged the preparation of the coup in order to call out all the « traitors » and then act even harder and with impunity, arresting them all. F. If the coup had been created overseas, the media and Western governments would have immediately sided with the military. Even Erdogan himself used with great effectiveness a FaceTime connection and Turkey CNN to talk to the population. CNN, a pillar of the US soft-power strategy. Something that Washington could have easily been prevented, if wanted. So what is the most likely scenario, excluding an external intervention? Erdogan’s political decisions have split Turkeys society in two parts. Although AKP is the first party and the president himself enjoys strong popularity among his followers, social tensions have only increased recently. The sense of dissatisfaction within the armed forces is something real, tangible and historically consistent with events in the country since the 60s’. Erdogan is aware that an Islamization of the country though Muslim Brothers (Qatar more than Saudi Arabia) has led the nation’s choices in terms of foreign policy to a dead end in both Syria and Iraq. Another big issue is the total impunity of many elements inside his government and security forces towards Daesh (if not complete complicity). All these elements have exacerbated rivalry with Syria, Iran, Russia and even with some Western and European partners. The real balance of power shifted when the largely hostile policies kicked in against Damascus and Tehran initially, Moscow later (the shooting down of the SU-24 and the consequent sanctions imposed by Russia). These situations quickly escalated reaching a tipping point. It’s more than likely that a coup had been in preparation since long time ago and it’s safe to say, that Erdogan probably discovered the initiative and perhaps used it to his own advantage (in what manner and how remains pure speculation at this time). Another plausible explanation for his recent statements in favor of Moscow and Damascus could be a direct consequence of an impending coup and time running out for him. Regional and international repercussions are all to decipher. There are several testimonies of authoritative sources who indicate a quick escape of Turkish military instructors from Aleppo, under direct orders coming from Ankara. A major coincidence remains, while Turkey was in the midst of a coup, Friday night, in Moscow Kerry and Putin were discussing Syria. Curious fact. The Russian president was one of the first heads of state to call Erdogan to show his support, as reported by the Kremlin. A few minutes before this conversation, and almost simultaneously, the Arab Syrian Army sealed, apparently permanently, Aleppo, isolating it from external supplies in what could prove to be a decisive event in the beginning of the end of Syrian conflict. Even with many uncertainties that remain uncovered, we can already conclude that the Turkish political aims on the region have changed significantly and realign now with more common interests with Moscow, Tehran and Damascus, rather than Riyadh, Doha and Washington. The words of the Iranian Foreign Minister Zarif have been supporting Erdogan since the beginning of the coup and blamed the petro monarchies, implicitly highlighting once again the absurdity of Ankara alliance with Riyadh and Doha. It’s likely that the Kurdish issue will become, with the domestic political sweep, Erdogan’s primary focus and that the unity of Syria will be the perfect expedient to prevent the unification of the Kurdish territory in the south of Turkey. A clear strategic commonality with Assad that would explain the renewed dialogue with Damascus. An attitude on a collision course with the United States that has always protected, armed and financed the Kurds. Moscow is becoming more and more a leading partner in this situation. The Sultan can give the impression of living in a situation of apparent strength (the domestic sweep was inevitable), but the truth is that in terms of international relations he has the absolute need to cooperate with nations that until recently he considered his sworn enemies. How regional tensions could have influenced or led up to the coup remain to be measured and undiscovered. The immediate certainty are the consequences that the coup will have on the future of the Middle East. That the coup in Turkey accelerated certain events in the region is yet to be understood, what is already clear though is the incoming victory of the Syrian-Iranian-Russian axle in Syria. Erdogan got lucky this time, maybe he knew how to make the most out of the situation. This still does not change the price he will have to pay for protecting his power. News coming from Aleppo indicates that he is bargaining his strategic advantages to remain in charge of his country, whatever the cost be. What repercussions this will have on the relationship between MIT (secret service) and Daesh is to be seen. His promises to focus on preventing the rise of a Kurdish unified state is another core issue. Also in this case, we will see how this may influence a serious future dialogue with Damascus. Ultimately, the coup failed and has left us with an Erdogan that to survive as president is obligated to decide on changing his policy towards Syria and the region. Unfortunately for him, the only way to do so is to say goodbye to his glorious dreams, shared with Qatar, Saudi Arabia and the United States. Will the Sultan put aside his ego and obey the new rules?